What to know: Heartwarminig tale of Little Brown Hare and an all white fawn. This film is based on the British book series written by Sam McBratney and illustrated by Anita Jeram, published in 1994 in the UK and in 1995 in the US. The book was a ALA Notable Children's book and sold over 28 million copies worldwide! I thoroughly enjoyed this short film and highly recommend it for kids and families. This is a heartwarming tale about Little Nutbrown Hare who wanders outside one night when he can't sleep and discovers a rare, all white fawn dancing in the snow. He knows all white fawns are rare and when he talks to her she runs away. Through lots of escapades Little Nutbrown Hare finally is able to convince his forest friends the fawn is real and able to befriend the white fawn. The characters are interesting and charming. A field mouse and a squirrel friends are all friends with Little Nutbrown Hare and they interact with each other in the most loving way. I felt sorry for Little Nutbrown Hare when no one believes that he had seen the white fawn. Eventually the truth comes out and they finally see her and believe Little Nutbrown Hare. The morale of this story is about love. 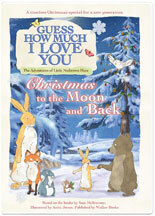 The love between Little Nutbrown Hare and his dad, the love of friends and possibility of the love of strangers. The negative behaviors shown are about doubt, but that disappears over time. I particularly enjoyed seeing the field mouse trying to protect Little Nutbrown Hare by making a white fawn out of snow. He tries to protect his friend's honor in doing so. The educational and social elements that make this film valuable emphasize the various ways that you can show someone how you love them. Adults often tell children that they love them and they can hear it in this story in a way they can relate to. The production values are outstanding, from the animation to the voice over talent to the background music. The images look like watercolors brought to life. I love them! I recommend this for ages 2 to 7 and give it 5 out of 5 stars. It uses vocabulary and ideas which little children can understand and enjoy. Questioning, probing and problem-solving are developed in a manner suitable for the target age. It is very enjoyable and charming. If you have a festival for preschool and early elementary kids, this will fit right in. Reviewed by Tina B., KIDS FIRST! Adult Juror.